These Turtles Hunt in Vicious Packs. Every horror movie maker in the world can stop trying—because we just found the best horror movie concept ever. African helmeted turtles hunt in packs. Death is coming for you very slowly...but in a big group. “That doesn’t look like the face of a ruthless pack hunter”—is the last thought a lot of animals probably have. 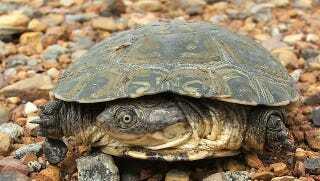 The African helmeted turtle is an extremely common little turtle. If you go to Africa and Madagascar you’ve probably seen them lazily sitting on the side of a river bank, warming themselves up. For the most part they eat worms, grubs, snails, and other small, slow invertebrates. Sometimes they go after larger food. When I heard that these turtles were pack hunters, I thought they might work together to comb through a section of mud, making sure all the small animals in it got driven into the mouth of one turtle or another. Nope. It’s something much more chilling. These turtles will band together to simultaneously latch onto larger animals, pull them down, drown them, and then tear them apart. They’ve been known to take out small mammals, and even drag birds down under the water. The photo’s not so cute now, is it?